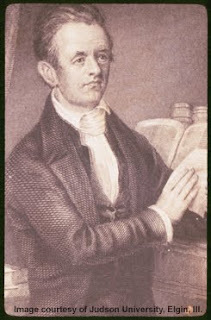 I found and listened to a few more biographical messages and resources on the life of Adnoniram Judson this week. John Piper gives his take on Judson with his typical exuberance and passion. Richard Belcher, author of the "Journey" books, gives an interesting account of the life of Judson in word and song. Historian Tom Nettles also presents a sketch of Judson as a pioneer missionary. In addition, you can listen to a reading of Judson's "Advice to Missionary Candidates" in which he reminds a prospective missionary that most who came to the East would die within five years of arrival.